Vibrantly colored leaves, temperatures dipping toward chilly, a scarf around the neck, a sweater across the shoulders, a spiced, hot beverage in the cup, this is October. And, as if these things weren’t delightful enough, there’s a familiar, mysterious tug, a gentle pull toward making, toward sewing, knitting, crochet. Toward whatever garments my hands might fashion. Maybe it’s part of the season’s nesting, of readying for winter’s coming. Maybe it’s just me, for memories’ and tendency’s sake. Maybe it’s the movement away from fast fashion, toward more thoughtful, ethical choices. Maybe it's Slow Fashion October. I take note (I’ve already taken stock). And I keep in mind my guidelines for making: simple, doable, enjoyable. Because, if not for these, the garments would go unfinished. Of course, I won’t make all of my wardrobe. This idea of hand making has to fit my right-now. I’ll be satisfied with making just one thing or two if that’s what these hands can produce this season. First up for the sewing machine? Finishing the linen skirt that’s been waiting a good long while. Good thing it’s gray, a color for all seasons. With wool tights and boots, it’ll fit well into fall. On the knitting needles, another cloche. Because the blue one I made got washed, and then dried, then shrunk, and the black one’s gone missing. After that? Socks. There are other hand made inspirations in the wings (this, these, this, and this) but I’m leaving them there, for now. For peace, and not overwhelm, to be plucked out when I’m ready. How about you? Are you given to flights of fancy when it comes to hand making clothes? 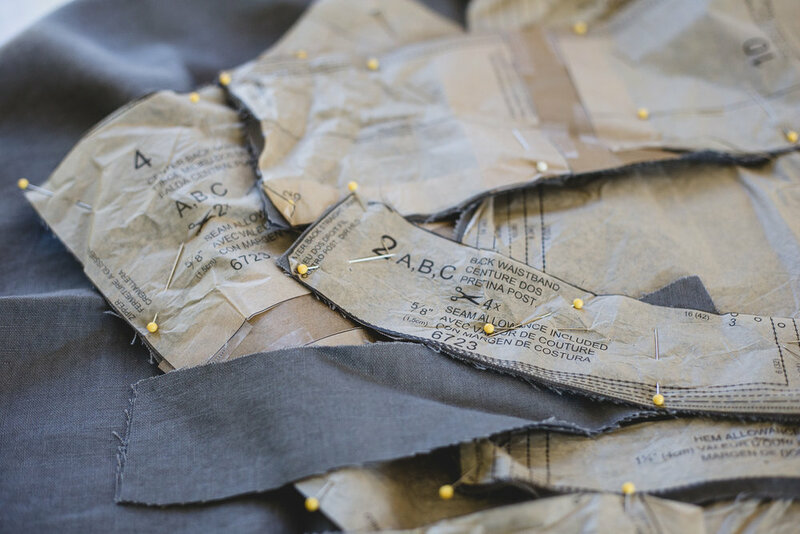 Are you inspired to try making your own, and/or supporting indie sewists and small companies who offer thoughtful alternatives to fast fashion?